What would cause someone to stack rabbits four high in wire cages inside a ramshackle garage or yard, and allow the urine and feces to pile up so high that animals are living in their own waste? You might guess that only a hoarder—or someone with a similar psychological condition—would do this. But there is another reason someone might be driven to keep animals in such horrid conditions. Profit. But other rabbit breeders rallied behind Cartheuser after the bust—presumably because they recognize that exposure of this sort would damage the reputation of their industry. When your business is run on the exploitation of rabbits, not all press is good press. 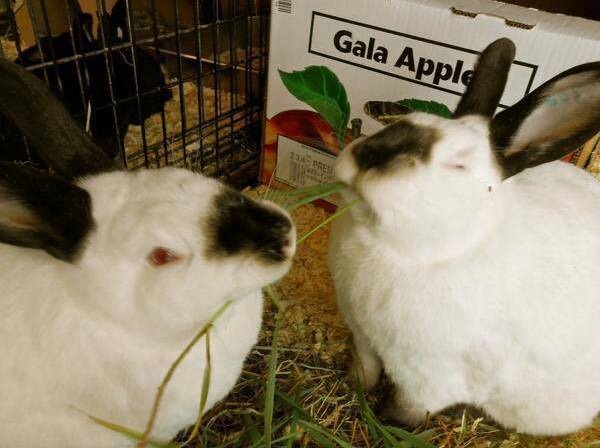 What does it say about an industry when someone facing charges for care and treatment violations is considered the “best in show?” Animal Control is now inundated with rabbits and working with rescue groups to place them in foster homes and to get them adopted. Thousands of miles away, a similar situation unfolded only a few days earlier. 52 rabbits were confiscated by animal control in Sacramento on Sunday, after seven rabbits kept outside in 107 degree heat died the day before. The owner was raising these rabbits for meat, feeding them nothing but an unnatural diet of bread, and keeping them in crowded cages. These bunnies were no different than the ones you see up for adoption at the shelter, yet they were being “farmed” as agricultural commodities with little to no regard for their safety or welfare. 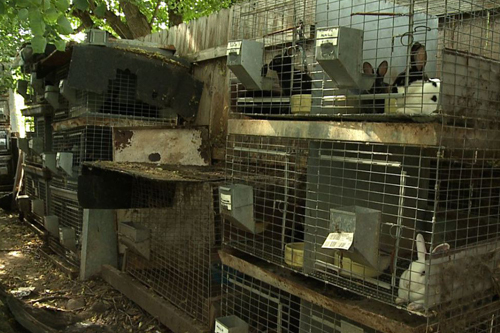 The standard “backyard breeder” rabbit housing is no different than a battery cage at a factory farm. The law can prosecute people in extreme cases, but in many places there are no rules preventing people from keeping hundreds of rabbits in cramped wire cages in the first place. As long as there is a financial incentive to breed rabbits, people will breed them—legally or not. What we can do for rabbits today—and for all animals—is to refuse to support industries that profit from harming them. Refusing to buy animals, eat animals, wear animal skins, or otherwise financially support the use of animal products is the best thing you can do to help all animals right now. Rabbit breeders and others who would harm animals for profit cannot do business if we don’t support them. If you live close to Sacramento or Indianapolis, please consider opening your home to a rabbit (or a pair!). To learn more about caring for rabbits as indoor companion animals, see the House Rabbit Society‘s website.